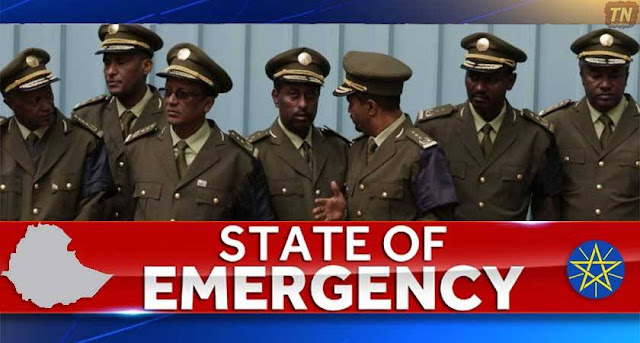 One week after declaring a six-month state of emergency, Ethiopian authorities released details of the law on Saturday prohibiting exchange of electronic messages and banning public gatherings and demonstrations among others. The state run media outlets on Saturday published details of the law as presented by the head of the command post secretariat in charge of the state of emergency and minister of defense, Siraj Fergessa. The emergency law prohibits the exchange of messages and information via the internet, cell phones, social media, television and radio. Publishing and distributing documents, holding demonstrations, showing protest gestures, importing and exporting published materials were also prohibited by the law. The law specifically mentioned two independent media outlets abroad and banned the public from watching and listening to television and radio programming by the Ethiopian Satellite Radio and Television (ESAT) and Oromo Media Network. The law gives power to security forces to monitor and block messages transmitted via television, radio and movie theatres. According to the law, strikes by workers as well as businesses and closing government offices in protest are illegal. The law says protests by students in universities, colleges and higher institutions of learning are also outlawed. The law gives power to security forces to take any action they deemed necessary against students who stage protest rallies. The emergency law stipulates that diplomats cannot travel beyond 40 kms radius outside the capital without prior authorization and permission from the command post. Members of the police and security forces cannot take leave of absence or resign in the duration of the state of emergency. A curfew is in effect from 6 p.m. to 6 a.m. local time in areas where there are economic infrastructures, factories, agricultural projects and other investments. The law also authorizes security forces to take whatever measure necessary against people who violate the curfew. Areas 50 k.m. inside the the country’s border are designated as red zones. The carrying of firearms are banned in the red zone. Other restrictions imposed in the rest of the country are also applicable in the red zone. Carrying firearms within 25 meters of highways connecting the capital Addis Ababa to major towns and destinations are also forbidden. Security forces are given permission to search and arrest anyone and confiscate possessions without a court warrant, according to the law. The emergency law also give security forces the power to take any action to defend themselves from any threat or attack. The Ethiopian regime last Sunday declared a state of emergency after a wave of anti-government protests flared up again following the massacre early this month of hundreds of festival goers in Bishoftu, 45 kilometers outside the capital, at a religious festival of the Oromos. Local political parties estimate close to 700 people were killed in a stampede as security forces shot tear gas to disperse protesters. Witnesses also say security forces shot and killed several people, who used the occasion to express grievances against the tyrannical government. A year long protest in the Oromo region, which was joined this summer by the people in the Amhara region has left hundreds dead as security forces use lethal force to disperse demonstrators, who demanded an end to a dictatorial rule.